With an intention to attract more advertisers to the social networking website, Facebook has launched a set of new tools called custom Audiences that will let all advertisers target people who visited their site or used their mobile app. The tools will not only allow marketers to reach out to users across devices but will even encourage them to take action. With the help of these tools, marketers will be able to provide customized messages to users who have visited their sites or mobile app, and some News Feed ads to feature call-to-action buttons. This feature was already introduced last year by Facebook however then it was available to limited number of test partners. As declared by Facebook, the feature will now be available globally in the coming months. Facebook explains its new features with some examples – a travel site with the remarketing pixel could use Custom Audiences to reach a group of people — say, people that searched for flights but never made a reservation — with a targeted message in News Feed: Come back for 10% off your next flight reservation. “Businesses will soon have a better way to drive people to their landing pages on both desktop and mobile. When a marketer creates a Page post ad driving traffic to their desktop or mobile website, they will have an option to add a call-to-action button, which will show up in the lower right-hand corner of the ad. 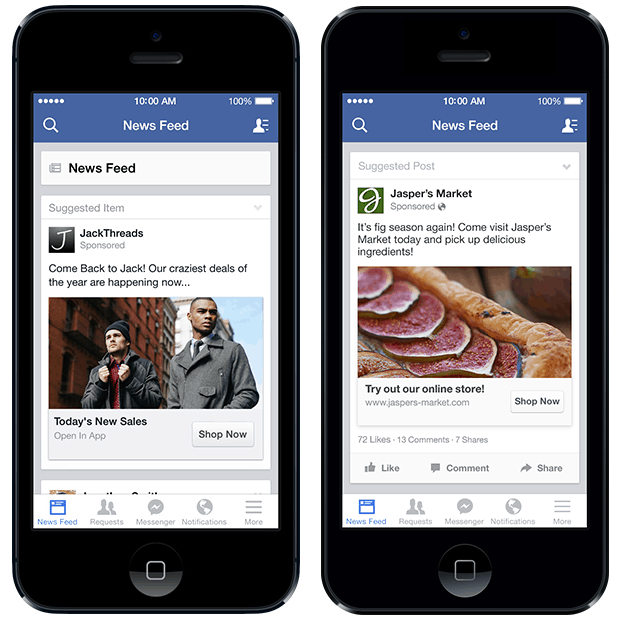 Marketers will be able to choose from five action buttons: Shop Now, Learn More, Sign Up, Book Now or Download,” says Facebook in a blog post.